Even a small business should have a big brand. Building a successful brand is all about consistency. That’s why I offer an integrated approach to design. It’s about con­stantly rein­forc­ing what you stand for across all touch points — so your audi­ences grow to rec­og­nize your brand and choose you… over the competition. Whether your a start-up or an established business that needs to step up their brand – I can help. I can provide integrated design solutions that includes; brand identity, logo, print, website, email marketing, PowerPoint, display, illustrations, and even packaging – getting all your creative from one source is an efficient way to create a consistent brand expression. When people hear the name of your business, it will conjure up a set of impressions that influences how they think and buy – those thoughts define your brand. Your brand actually resides in your customer’s mind. It’s a result of all the impressions made by all encounters with your name, logo, marketing messages, and any thing else that people see or hear about your business. Every time someone comes to your place of business – looks around, visits your website, interacts with you or an employee, views an ad, that person forms an opinion or mind-set about your business. 1) Proper branding is critical to your long term success. Some think branding is all about their logo. But in reality, branding is managing the thoughts and feelings of your customers to ensure they choose you. If your desired brand image isn’t what’s in the minds of your target audience, you’ve got to figure out how to address the gaps. 2) A brand’s visual identity is the overall look of its communications. Effective visual brand identity is achieved by the consistent use of particular visual elements to create distinction, such as fonts, colors, and graphic elements. At the core of every brand identity is a brand mark, or logo. 3) Your logo is only one part of your overall brand or corporate identity, but still a very important part. Your logo is a symbol, name or trademark that should concisely represent your brand. You should get excited about your logo – if you’re not, customers won’t be! 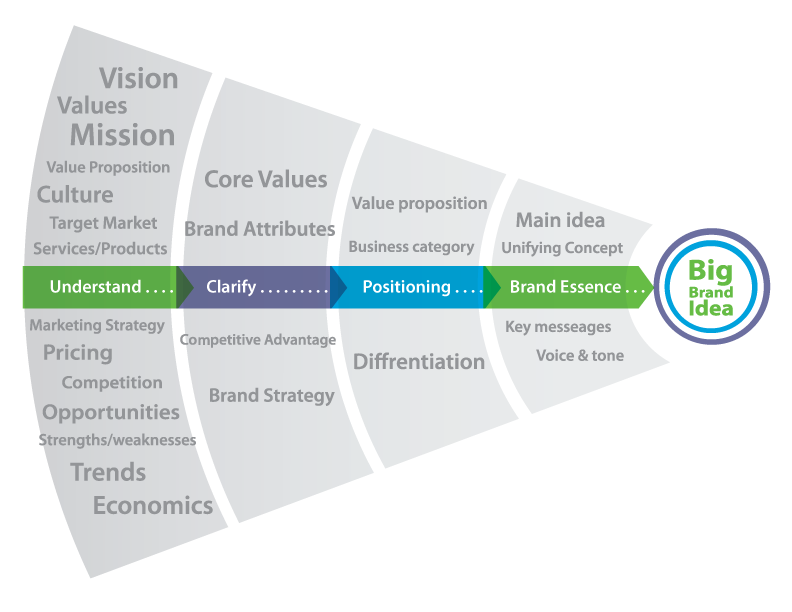 4) Create Brand Standards for your business. Think you’re not big enough to worry about your brand standards? Even the smallest companies should develop and maintain basic brand standards from the very beginning. Focus on consistency in the following five areas: logo, graphics, color, fonts, illustration and/or photo style. 5) Stand for something. People want what they can understand and appreciate. If you’re trying to be everything to everybody, chances are you’ll not attract anyone. Better positioning allows you charge more for your services. Remember customers seek out experts, not generalists. It’s important to fully commit to your branding. Treat every function of your company, brand identity and design, to product offerings and sales – as an integral part of your brand. It starts with every interaction your business has with customers, vendors, and employees. Do it right and you’ll get a great ROI! Ready to build your brand? I have tons of experience creating brands, rebranding, and elevating existing brands. It's a big difference maker!